JUST SAYIN’--The New Year is here: the time when Americans make all sorts of resolutions they know they won’t keep. And since the City of Los Angeles as an administrative entity has not, so far, been very good at keeping to its own resolutions—note the modest progress on implementing Complete Streets and Vision Zero, and the roadblocks already being set up in front of Mobility Plan 2035,–I offer a grand resolution absolutely free of charge to City Hall. Hell, even if they don’t ignore it as completely as I expect, they won’t keep it anyway, so it fits right into the tradition. Sounds like more of that “War on Cars” crap, doesn’t it? But the fact is, that the “War on Cars” is a suicidal one waged by cars themselves, who are eternally in each other’s way—and the rest of us, the diverse urban cultures that struggle to live and thrive among our snarl of battlefield streets, are collateral damage. Listen: even CalTrans now admits that you can’t build your way out of congestion: thanks to induced demand, new lanes, roads, and parking spaces fill up within a very short time. The truth is , that no matter what you do, the intensity of congestion will remain the same, or get worse: absent techniques such as congestion charging, motorists will see roads as a free resource to be exploited to the ultimate limit. In any thriving city, there will always, always, always be the same intensity of congestion in all facilities that permit cars. The way to reduce congestion is to grant less space to cars. There will still be congestion, just less of it. But there will then be space to allocate to more efficient modes of treavel, such as walking, cycling, and transit, as well as to community space or economic development. Those who do not feel comfortable driving in clots of traffic will have other options that they do not have now—since we have been subjected to an eighty-year automotive jihad designed to force us all to drive everywhere, all the time, forever. A social engineering failure at its worst! Magic technologies won’t solve the problem: massed ranks of platooning robocars won’t do it, ragged amateur armies of Uber galley slaves won’t do it, feeding electric power from Four Corners into Tesla batteries won’t do it. 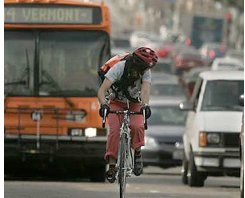 Only emulating the San Francisco earthquake of 1989 wlll do it: back then, Mother Nature tore down the Embarcadero Freeway, and San Fran replaced it with a Complete Street comprising just a couple of car lanes, a couple of bike lanes, a trolley line, and big wide sidewalks. And the waterfront suddenly turned into a commercial and community centerpiece! This is hard to do without tectonic assistance (though many cities are starting to tear down freeways voluntarily), because the congestionnaires are very good at whining loudly to make us all subsidize their predilection for driving three blocks to pick up a bottle of cinnamon whiskey (this week’s slug of choice for the obliterati, who will then ever so fragrantly run us down)…. However, if we wish for Los Angeles to remain a world-class city, we will have to emulate what San Francisco, New York, Paris, Seoul, and other thriving burgs have begun to do, and push back against the insurgence of private cars, an insurgence that crushes our cultures even more effectively than it squashes our neighbors.